Do you want a better focus and better working brain? Why not play a game to exercise your brain and push it to its limits? So many games nowadays offer you the chance to enjoy yourself playing addictive gameplay while you push your brain to its limits, solving challenging and tricky levels. Because these games are quite popular, choosing the best one is not easy. To make the search easier, we have for you one incredible mind trick game you would love. Let’s see what the game offers. What is this brain trick game about? 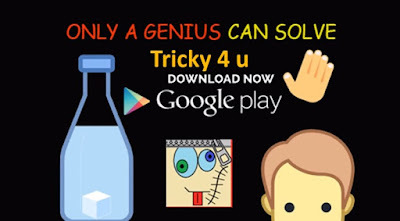 This brain trick game is easy to play, fun and addictive but yet highly challenging developed on android platforms for all players that like to get their brain to think harder and faster just to not get tricked. The players need to solve every tricky level as fast as they can to become the best player of this exciting IQ game. Offering the players a chance to solve incredible tricks again and again while they progress further and challenge their mind with each trick. Highly unique, this mind trick game will get players addicted fast and keep them interested in playing each time. Why do we choose Tricky 4 u? Tricky 4 u has to offer all trivia loves one amazing game with incredibly addictive and fun features that will challenge them and their brain with every level offered. This game offers different tricky levels that will try to trick the brain of the player and each of the levels on the game has different stunning idea that will push the player’s brain to its limits. The player on the game is not asked to do anything or to go back and solve a level he can’t, he can play and try to solve the next one if the wants without the need to solve each of the levels before. The one task of the player is to try and not get tricked. If a player is stuck at some level he can easily use the game’s ‘’Hint’’ button that can help them get faster to the solution. If a player can’t solve any level he can use the game’s ‘’Solution’’ button to get the final solution before he moves to the next tricky level. The player can use unlimited amount of time and lives to solve any of the levels, taking his time and trying to solve the tricks. Download this game now on Google Play for free to push their brain and try to solve the tricky levels!